News - October 2012 - Do you feed your garden birds? 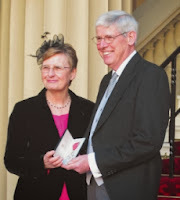 Congratulations to the Chair of the Friends of Paxton Pits Nature Reserve, Dr Ray Matthews, who was awarded an MBE for 'services to Conservation in Cambridgeshire' in the Queen's Birthday Honours List. 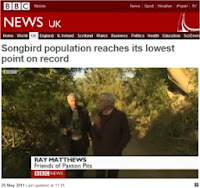 In a BBC Countryfile article about the decline of the songbird population, Paxton Pits is featured as a location where the nightingale is thriving. Ray Matthews, Chair of the Friends of Paxton Pits, takes presenter John Craven on a tour of Paxton Pits, and John sees his first nightingale.